They’ll sing the praises of this tasteful assortment. 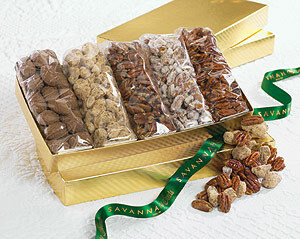 Gold gift box includes five old-fashioned Southern favorites including Roasted Salted Pecans, Chocolate-Covered Pecans, Praline Pecans, Glazed Pecans, and Sugar & Spice Pecans, all individually presented in gold striped gift bags. Our customers tell us they can’t get enough of our down-home, Southern goodness. 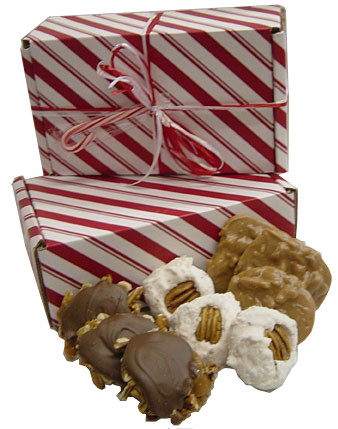 So we created this special gift box with three long-time favorites nestled inside: our famous, traditional Pralines, marvelous Milk Chocolate Pecan Paws™ and exquisite Divinity. Life doesn’t get much sweeter than this! 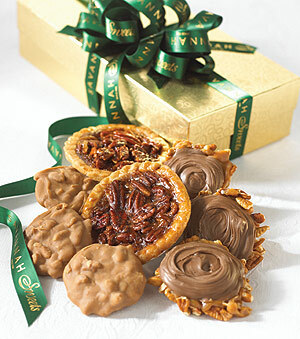 Our golden gift box arrives filled with old-fashioned Southern Pralines, Milk Chocolate Pecan Paws™, and two mini Pecan Pies. All are made fresh daily to ensure maximum freshness. 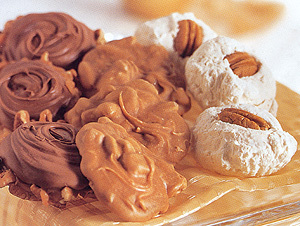 We grew up with these old-fashioned favorites and are proud to share them with you. 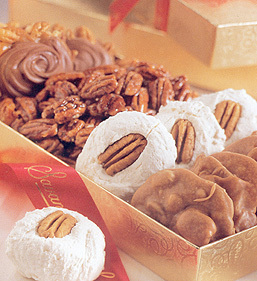 Our golden gift box is packed with a delicious, Southern-style selection of Glazed Pecans, heavenly Divinity, traditional Pralines and creamy Milk Chocolate Pecan Paws™. Southern hospitality never tasted this good. 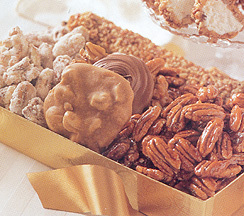 The perfect gift for family, friends, clients and business associates, this special gift box is filled with Glazed Pecans, Sugar & Spice Pecans, Praline, a Pecan Log Roll and a Milk Chocolate Pecan Paw™. Three Southern Favorites for one delicious price. 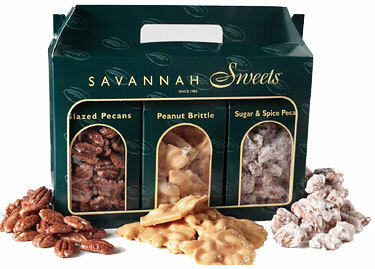 Available with your choice of treats, this gift pack includes three 8 oz boxes each of items listed above.